Get your phone. Get a charger. Find a wall. That’s how it usually works when you travel with just your phone charger. You’re dependent on the electric grid and the few wall outlets you can find. Unfortunately, in a lot of countries, particularly in remote areas the electricity is not the most dependable. If you’re out traveling and want to charge your phone regardless of where you are (i.e. in the middle of the Andes or in the Mongolian plains), you need a solar panel. Even if you’re not a hard-core adventure traveler, a solar panel can be for you if you want to go green, or hike often. Although it may sound high-tech and complicated, using a solar panel is quite easy even for those not familiar. The EasyAcc 28W solar panel is a pretty straightforward portable panel. Its panels are divided into 4 parts and it has 4 USB output sockets. Plus, it can fold up allowing travelers to easily pack it. Position the solar panel into the sunlight. You will notice a tiny red light light up. That’s it. The most important step when using the solar panel is the positioning. If the panel isn’t directly in the sunlight, it’ll take hours for your electronics to charge. The EasyAcc 28w panel can charge an iPhone with ease, and I’ve even been able to charge 2 iPhones and a pair of bluetooth headphones simultaneously. With it’s 4 output ports, the panel allows you to charge up to 4 devices at once, but from my experience, the sunlight usually isn’t strong enough for that to make sense. If it’s not in direct sunlight, the charging process will be incredibly slow, so it’s important to position the panel right. In bright sunlight, I’ve been able to charge my iPhone 5s in around 1 hour. 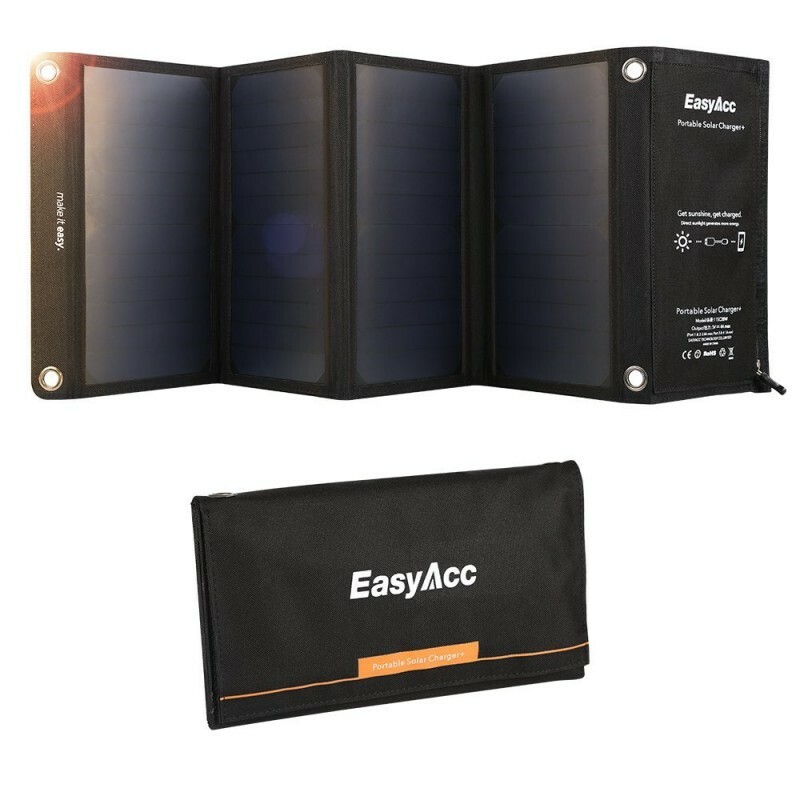 I highly recommend using the EasyAcc solar panel along with an external battery. Plug a battery, like the EasyAcc Monster battery into the solar panel, and charge the battery, rather than charging your phone or USB powered devices directly. This way, it’s simpler and you can store more power to charge your devices via the battery even when the sun is down. My only gripe about the EasyAcc solar panel is that it isn’t extremely rugged. One of the things I wanted to do with the solar panel was to leave it outside unattended so it could charge my battery in direct sunlight. Since the solar panel is not waterproof, I couldn’t just leave it and forget. However, it will survive light rain or splashes. 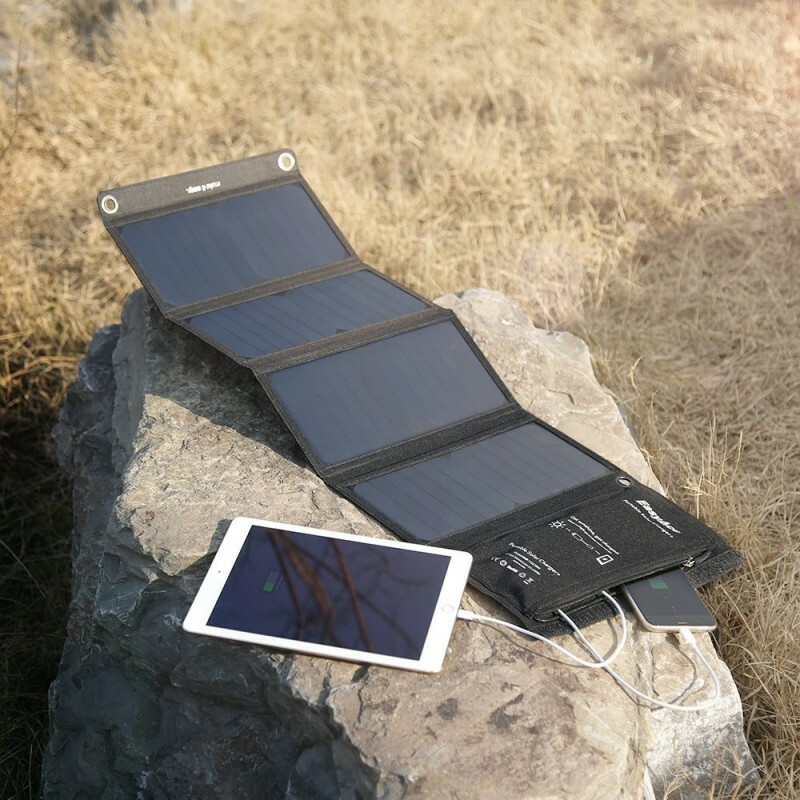 Overall, the EasyAcc 28W solar panel is an easy to use and fast charging solar panel, great for adventure travelers, campers, hikers and those who want to go green. The EasyAcc solar panel was provided for this review. As always, this EasyAcc solar panel review contains only my honest views and opinions. 🙂 Find out more about me and this site here. What does mAh mean for external batteries and smartphones? What does mAh stand for?